Discover the biodiversity of Costa Rica on a day trip from San Jose to the Monteverde Cloud Forest. The massive ecological park maintains six different climate zones and is home to more than 400 species of birds, 2,500 plant species, and hundreds of animal species. 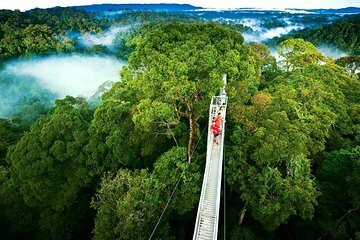 Take a stroll along the SkyWalk, standing at 130 feet, for an aerial view of the forest. This tour includes breakfast, lunch, and entrance fees.